This is not the place to give an account of the romantic discovery and development of radio-location. It may be explained, however, that the backbone of the system consisted of a series of large “chain” stations at intervals averaging about 30 miles. These gave a warning, by means of reflected electrical echoes, of the presence of aircraft within the radius of their effective action, which attained to nearly 200 miles in the most favourable circumstances. The average effective radius was about 80 miles, but they had the serious limitation that they failed altogether to give indications of aircraft flying below 1,000 feet. To overcome this disability, which was particularly hampering to operations against low-flying minelayers, smaller units called Chain Home Low Stations were included in the protective line. These had a restricted range (about 30 miles), and were incapable of giving heights with any degree of accuracy; they were, however, extremely accurate in azimuth, and constituted an essential feature of the Defensive and Warning Systems. The radio-location system was growing so fast and had to meet so many calls from overseas that the training of the technical personnel and the maintenance of the elaborate scientific apparatus presented great difficulties. In spite of these handicaps, however, the system operated effectively, and it is not too much to say that the warnings which it gave could have been obtained by no other means and constituted a vital factor in the Air Defence of Great Britain. The functions of the Observer Corps (since granted the “Royal” prefix) are too well known to require description here. Suffice it to say that this loyal and public spirited body of men had maintained their watch with admirable efficiency since the beginning of the war and throughout a winter of exceptional severity. It is important to note that, at this time, they constituted the sole means of tracking enemy raids once they had crossed the-coast line. Later experience was to show that “sound plots” which were all that could be given for night raiders, and aircraft flying above clouds or at extreme altitudes, were not adequate for purposes of accurate interception; but their work throughout was quite invaluable. Without it the Air Raid Warning systems could not have been operated, and Inland. Interceptions would rarely have been made. 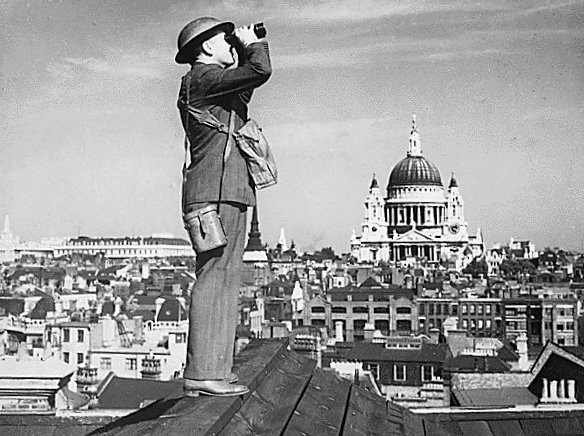 The credit for building up and developing the Observer Corps in recent years is due largely to its commander, Air Commodore A. D. Warrington Morris; C.M.G., O.B.E. The Fighter Command was divided into Groups and Sectors. Only Nos. 11, 12 and 13 Groups were fully organised at the beginning of the Battle. Each Group and Sector Headquarters had an operations table generally similar to that already described at Command Headquarters, but covering an appropriately smaller area. The British Isles and neighbouring seas were covered by an imaginary grid which was used by all concerned for plotting purposes. An expression consisting of one letter and four digits gave the position of a point with an accuracy of 1 square kilometre. Plots from which tracks could be built up were received first from the radio-location station, and later from the Observer Corps (and to a small extent from searchlight detachments) after a raid had crossed the coast. All radio-location plots came to a “filter room” table at Command Headquarters (next door to the room in which the operations table was situated), and, after surplus information had been eliminated, tracks were passed – by direct telephone line simultaneously to my operations table and to those of Groups and Sectors concerned. Observer Corps plots, on the other hand, went first to Observer Group Centres (where plotting tables were also installed) and thence to Sector and Group Operations tables. The tracks were then “told” to my Operations Room from the Group tables. In order to avoid waste of flying effort and false air raid warnings it was obviously very necessary to differentiate between friendly and enemy formations, and this was the most difficult as well as the most important task of my Filter Room. Liaison Officers from Bomber and Coastal Commands were permanently on duty, and they were in possession of all available information concerning the operations of our own bombers and coastal patrols. During 1940 an electrical device became generally available which modified the echo received by the radio-location system from our own aircraft in a characteristic manner. This was of the greatest value. The credit for working out the complicated details of the Filter Room belongs largely to Wing Commander R. G. Hart, C.B.E. It appeared to me quite impossible to centralise tactical control at Command Headquarters, and even Group Commanders would be too busy during heavy fighting to concern themselves, with details of interception. The system was that the Command should be responsible for the identification of approaching formations and for the allotment of enemy raids to Groups where any doubt existed. Group Commanders decided which Sector should meet any specified raid and the strength of the fighter force which should be employed. Sector Commanders detailed the fighter units to be employed, and operated the machinery of interception. Various states of preparedness were laid down, e.g., Released, Available (20 minutes), Readiness (5 minutes), and Stand-By (2 minutes), and Sectors reported all changes to Group Headquarters, where an up-to-date picture of the state of affairs was recorded by lights on the walls of the Operations Room. Various liaison officers from the Observer Corps, guns and searchlights were maintained in Group and Sector Operations Rooms. It will be seen that the Sector Commander had on his table the best available information as to the position and track of an enemy formation; but, in order to effect an accurate interception, it was necessary that he should also know the position and track of his own fighters. This was recorded by means of R/T D/F (Radio Telephony Direction Finding). R/T signals were transmitted automatically for 15 seconds out of each minute by selected fighter aircraft and were picked up by two or three D/F stations installed in Sectors for the purpose. The readings were passed by direct telephone lines to Sector Headquarters, and a mechanical plotting device gave an almost instantaneous – plot of the fighter’s position. In the more recently organised sectors these D/F stations had not been installed, and it was necessary to keep track of the fighters by giving them precise orders as to speed and direction, and plotting their tracks by dead reckoning. This method was adequate only if the force and direction of the wind at various altitudes could be correctly estimated. The sector commander could thus see on his operations tables the positions and courses of enemy formations and of his own fighters, and was enabled so to direct the latter as to make interceptions with the former in a good percentage of occasions by day. Interception depended, of course, on the fighters being able to see the enemy, and, although the system worked adequately against enemy formations in daylight, the degree of accuracy obtainable was insufficient to effect interception against night raiders not illuminated by searchlights, or against individual aircraft using cloud cover by day. Orders were given to pilots in their aircraft by means of a very simple code which could be easily memorised. For instance “Scramble” meant “take off”. “Orbit” meant “circle”. “Vector 230” meant fly on a course of 230 degrees. I realised that the enemy might pick up the signals and interpret them, but any elaborate code was out of the question if it included reference to some written list in the air. As a matter of fact the enemy did pick up and interpret the signals in some cases, but not much harm was done, except when they were able to discover the height at which a formation was ordered to operate, and the time when it was ordered to leave its patrol line and land. “Pancake” was the signal for the latter operation, and I therefore introduced several synonyms, the significance of which was not obvious to the enemy. The code word for height was “Angels”, followed by the number of thousands of feet; when it appeared probable that the enemy were taking advantage of this information I introduced a false quantity into the code signal. Thus “Angels 18” really meant “fly at 21,000” and not 18,000. On more than one occasion German Fighter formations arriving to dive on one of our patrols were themselves attacked from above. The system as a whole had been built up by successive steps over a period of about four years, and I was not dissatisfied with the way in which it stood the test of war. A serious handicap, which I have not hitherto mentioned, was the fact that the change over from high frequency (HF) to very high frequency (VHF) radio telephony was still in progress. The VHF was an immense improvement on the HF, both in range and clarity of speech; but the change over, which had started nearly a year before, was held up by the slow output of equipment. This meant that much work had to be done on aircraft radio equipment during the Battle, and squadrons equipped with VHF could not communicate with HF ground stations, and vice versa. The distribution of Army units was, as a matter of fact, in a condition of perpetual change to meet new situations as they arose, and I must pay a very sincere tribute to the flexibility of the Army organisation, and to the tact, patience and loyalty of the Commander-in-Chief of the Anti-Aircraft Command, Lt. Gen. Sir Frederick A. Pile, Bart., K.C.B., D.S.O., M.C., which enabled these constant changes to be ‘made without disorganisation. In theory the Commander-in-Chief, Fighter Command, was the authority responsible for settling the dispositions of all guns allotted to the Air Defence of Great Britain; but this was little more than a convenient fiction. The number of guns available was so inadequate for the defence of all the vulnerable targets in the country, and the interests concerned were so diverse and powerful, that it was not to be supposed that an individual member of any one Service would be left to exercise such a prerogative uninterruptedly. A disproportionate amount of my time was taken up in discussions on gun distribution, and each decision was at once greeted with a fresh agitation, until finally I had to ask that all proposals should be discussed by a small Committee on which all interests were represented, and I normally accepted the recommendations of this Committee during quiet periods. During active operations I consulted General Pile, and we acted according to our judgment. One rather important lesson emerged from our experience, viz., that the general fire-control of all guns in the Air Defence System should be vested in the Air Defence authorities. I do not, of course, mean that, if an invasion had taken place, the guns co-operating with the troops in the Field should have been subordinated to any AA Defence Commander, but the existence of ” free-lance ” guns, the positions and even the existence of which were unknown to me, was an appreciable handicap, especially at night. These guns belonged to Field Force Units. As such units were, of necessity, highly mobile, their exact location was not always known to Fighter Command. Nor, after a recent move, were they always included in the telephone system. It was impossible to acquaint them with the approach 1 of enemy raiders, or of the fact that our own aircraft were working in the vicinity. When the night attacks on London began to be really serious, General Pile, in consultation with myself, decided to send heavy reinforcements. Within 24 hours the defences to the South and South-East of London were approximately doubled, and the great increase in the volume of fire was immediately noticed and had a very good effect on public morale. The physical effect in the shape of raiders destroyed was by no means negligible, but the main effect was never generally known. The track of every raid was, of course, shown on various operations tables, and on some nights as many as 60 per cent of the raiders approaching London from the South turned back after dropping their bombs in the open country or on the fringe of the barrage. The AA Guns at Dover enjoyed unusual opportunities for practice, with the result that their crews became acknowledged experts in the art of anti-aircraft gunnery. Their skill, however, was attained through the circumstance that they and the Dover Balloon Barrage were continuously the objectives of German attack. They manned their guns continuously night and day, and I must pay a high tribute to their morale, enthusiasm and efficiency. The balloon barrages had, at this stage, had little opportunity of justifying their existence, except perhaps at Rosyth and Scapa Flow, since bombing attacks against land objectives in Britain had not yet begun. It was thought, however – and later experience confirmed this opinion – that the heavy cost of their installation and maintenance, and their drain on man-power, were on the whole justified. It is true that their material results, in terms of enemy aircraft destroyed, were not impressive, they suffered staggering casualties in electric storms, and had brought down a number of our own aircraft. On the other hand, they exercise a very salutary moral effect upon the Germans and to a great extent protected the vital objectives, which they surrounded, against low-altitude attacks and dive-bombing. The air raid warning system was operated centrally from Fighter Command headquarters (with a small exception in the Orkneys and Shetlands). The country was divided into about 130 “Warning Districts”, the boundaries of which were determined by the layout of the public telephone system. These districts were shown on a map in my Operations Room, and the tracks of all enemy -raids, whether over the land or sea, were plotted by means of counters deposited and removed as necessary by a number of “plotters”. The counters were of three colours, according to the 5-minuite period in which they were placed on the table: This was necessary to facilitate their removal at the end of 15 minutes, and so to obviate the confusion caused by “stale” plots. Three telephone operators were in continuous communication with the Trunk Exchanges in London, Liverpool and Glasgow, and when a raid was within 20 minutes’ flying distance of a warning district the air raid warning officer would send a message, as, for instance: “10. Norwich. Yellow.” The London operator would transmit this to the London Trunk Exchange, and the London operator would immediately retransmit it to Norwich, where other operators would pass it on to approved recipients in the Warning District. This was a preliminary caution for the information of Police, Fire Stations, &c., and involved no public warning. At night, when it became essential to maintain exposed lights in dockyards, railway sidings and factories up to the last minute, so as to obviate unnecessary loss of working time, a “Purple” warning was introduced. . This was a signal for the extinction of exposed lights, but it did not connote a public warning. There were also subsidiary warnings, transmitted by a fourth operator, to close down radio stations which might assist the enemy’s navigation by enabling him to use wireless direction finding. The credit for working out this system in conjunction with the Home Office is due largely to Air Vice-Marshal A. D. Cunningham, C.B.E. 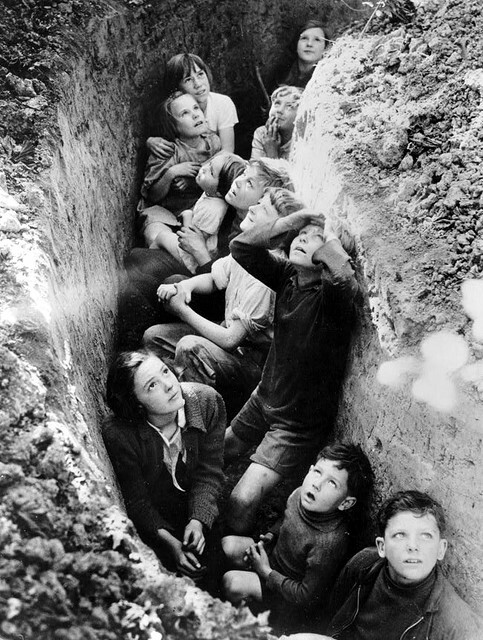 School children huddled together in a makeshift air raid shelter experience a range of emotions as aerial battle rages high overhead. The public air raid warning system was operated centrally from Fighter Command headquarters. Thanks to its integration with the operational command of the battle and well-developed telecommunications system it proved to work well, saving the lives of many civilians. About the time Battle of Britain entered its second phase an improvised repair system was organised and worked well. With the hearty co-operation of the Ministry of Aircraft Production it was decided that units should be relieved of all extensive repairs and overhauls, both because of their preoccupation in the Battle and because of the danger of further damage being done by enemy action to aircraft under repair. Broadly speaking, any aircraft capable of returning to its base was capable of another 15 minutes straight flight to a repair depot: aircraft incapable of flight were sent by road. Small repairs, such as the patching of bullet holes, were done by the unit. 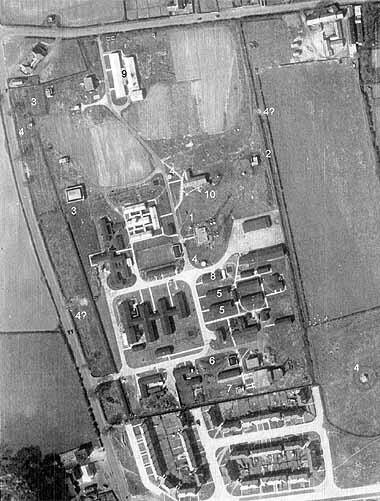 Two such repair depots were improvised about 30 miles to the west of London, and this undoubtedly prevented an accumulation of unserviceable aircraft at fighter stations.